In 2010, as in 2007, the entire technology industry gathered at the Consumer Electronics Show (CES) in Las Vegas, only to have the hot tech news of the week usurped by a smartphone announcement back in the Bay Area. In 2007, it was the announcement of the iPhone at Macworld Expo. This year, Google tried to replicate the experience by calling a media-only event of its own to announce the Nexus One, the first device running the search-engine giant’s Android operating system to be sold directly by Google. Unlike the iPhone announcement, which was revolutionary, the Nexus One announcement marked the evolution of Android. A few months before, Motorola’s Droid was announced as the first Android phone that could really compete with the iPhone. I tried a Droid and, quite frankly, came away disappointed. But the Nexus One, with its fast processor and streamlined design, looked like it was worth a test drive. With a new Nexus One in hand, provided on loan from Google, I spent several days using the Nexus One as my only smartphone, and another week with it in one pocket and my iPhone 3GS in another. But my purpose here is not to review the Nexus One—you can read Ginny Mies’s full review ( ) for those details. I'm here to look at the Nexus One and consider where it’s better than the iPhone, where there are notable differences, and how Apple’s platform might progress when we see the next generation of iPhone hardware and software. How does the Nexus One rate as a smart phone? It’s a really good device. It outdoes the iPhone in a few areas, and its weaknesses show that Apple’s device still has some serious advantages. When I first mentioned I was trying out a Nexus One, I heard from a collection of Mac users who seemed stunned by the idea that any Mac user would use a non-Apple smartphone. Yes, it’s true that many smartphone operating systems—I’m thinking Windows Mobile and BlackBerry—have been indifferent or even hostile to Mac users in the past. Android seems different. In fact, Android doesn’t seem to have been designed with the existence of personal computers in mind. You can use an Android phone even if you never, ever connect it to a computer. That said, I found using the Nexus One with my Mac to be easy. It helped that I already sync my iCal calendars with Google Calendar using BusyMac’s $25 BusySync ( ) utility. Because of that, all I had to do was point the Nexus One at those calendars, and the phone was in sync with the data my Mac. The Nexus one ships with a built-in Gmail client, but it’s also got a separate app that’s a full-fledged IMAP client, which I connected with my work and personal e-mail accounts. That was easy. It’s easy to access the Nexus One’s onboard microSD memory card, either by connecting the phone to your Mac and mounting it directly or (slightly less conveniently) by removing it entirely and using a card reader to do the job. Once the card is mounted, you can just drag music, videos, and photos onto it and they’ll be recognized by the built-in Music and Gallery (photo/video player) apps. But that’s not a very friendly solution. Better is to use Salling Software’s Salling Media Sync utility ($22, free-but-slow-to-sync version also available), which automatically syncs your iTunes playlists and iPhoto albums when you mount the memory card. Is the Nexus One as integrated into the Mac experience as the iPhone? Absolutely not. But if you integrate your Mac with Google’s data services—most specifically Google Calendar—the Nexus One will fit in nicely. It’s not as seamless as the Apple experience, to be sure, but it’s not hostile, either. When the iPhone first hit the scene, it was far ahead of any other device in almost every way. (There were exceptions, of course, like support for MMS messaging and voice dialing.) The entire smartphone market has transformed over the past two years in reaction to the iPhone — and in some areas that game of catch-up has turned into leapfrog. There’s no doubt that the Nexus One has some features that I find superior to what’s available on the iPhone. The Android home screen is more flexible than the iPhone's, and you can install small Widgets on it. A more flexible home screen. The iPhone’s home screen was originally designed for a device with a fixed number of apps, all of which Apple could display on a single screen. With the advent of the App Store, Apple expanded the metaphor—by adding more pages with more app icons. Page after page of icons. Every app you download will, in fact, show up on one of those pages until you fill them all up. The Nexus One will let you fill your home screen with icons, if you like. But you can choose which apps show up on the home screens; to bring up a scrollable list of every app on your phone, you tap the app button at the bottom center of the screen. It’s a nice way to give you quick access to your favorites, while also keeping every app within reach. Widgets. 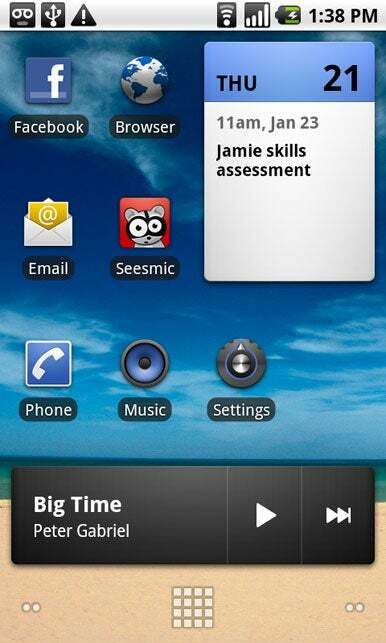 Widgets are small mini-programs that run right on your home screen. For example, one built-in widget displays your current weather and scrolls through news headlines. Another is a Google search box. Yet another lets you quickly turn off some basic phone settings, including Wi-Fi, Bluetooth, and GPS. I quickly added a calendar widget to my home screen, which shows me my next appointment—and doubles as a shortcut I can tap to take me to the full Calendar app. None of the Widgets are mandatory. You can add or remove them at will. But I like them. That same information is there behind every app on my iPhone; I just have to tap individual apps to bring it forward. Now when I look at my iPhone, I see a wall of apps waiting for me to tap them. On the Nexus One, I see what I need to do next and what music I’m currently listening to (with a control to quickly pause or move to the next track). It’s a good idea. A look at the pull-down notifications list. Notifications. The iPhone doesn’t do notifications very well. If it wants to get your attention, it throws up a window with a message that interrupts what you’re doing, and that’s it. It also doesn’t deal with multiple notifications well — they’re just a series of those same single notifications. If you dismiss one accidentally, you can’t find it again. It’s a system designed for a simpler time, and with thousands of apps and a spiffy push-notification service any developer can use, that time is gone. Android on the Nexus One, on the other hand, has a new notification trick. It can pulse the light on its trackball to let you know something’s going on. And to see your notifications, you can pull down the menubar at the top of the screen. 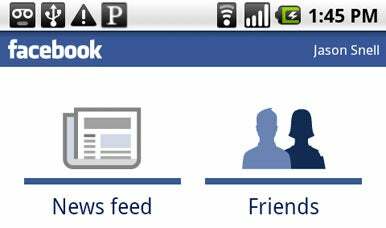 It’s easy to see all the notifications at a glance, and you can tap on one to go to the relevant app. I can’t say I think Android handles notifications perfectly. This is an instance where Android may do something that the iPhone can't do, but doesn't pull it off in a way that really satisfies me. Or to put it another way, Android does more to address the problem, but doesn’t completely solve it. There’s a better answer here, and neither Android nor iPhone has found it. The P in the title bar indicates that Pandora is running in the background. In any event, these tiny bits of multitasking in the iPhone don’t address the larger issue, which is that some apps really need to be able to run in the background in order to reach their fullest potential. The poster-boy app for this cause is Pandora, the streaming-music service. Pandora’s not a faceless MP3 stream that you can play in Safari; it’s interactive, allowing you to customize your stations and control playback. Still, you should be able to start playing it, then switch to another app, then switch back to Pandora when you want to interact with the service. On the iPhone, that’s currently impossible: if you want to listen to Pandora, you can’t do anything else with your phone. Another good candidate would be GPS-based apps, such as photo loggers, or running/ biking loggers, or location-based social-networking services such as Loopt and Google Latitude. There are a few other uses, too. In any event, Android lets apps run in the background. If you aren’t paying attention, you wouldn’t notice most of the time. Using the Nexus One, I never ran into a situation where I needed to find and quit apps in order to speed things up. Running apps in the background can cause your battery to drain faster; that’s the top reason that Apple says it has avoided adding background capability for third-party apps. I get that, but if I want to drain my battery listening to Pandora, or receiving notifications every time anyone mentions me on Twitter, I’d like to be able to make that decision. I don’t think that Apple needs to implement the same philosophy of multitasking as Android. There should probably just be a special class of apps that are allowed to run background tasks, and users would be able to choose whether they want them to run them that way. Perhaps Apple could require those apps to undergo an extended approval process. But there needs to be something. 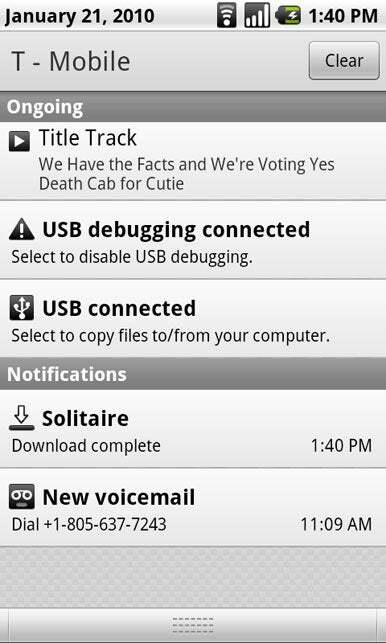 It’s an absolute joy to run Pandora in the background on the Nexus One, and it’s a clear Android advantage over the iPhone. A feature not available on the iPhone: A combined view of all your e-mail account Inboxes. 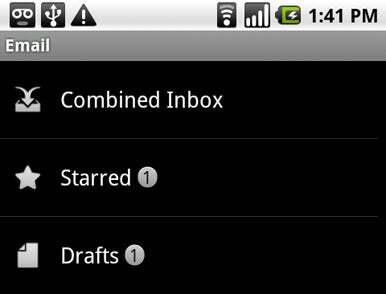 Combined e-mail inbox. It’s a feature that’s been on Macworld’s wish list since the original iPhone came out, and yet Apple has never addressed it. A lot of us—most notably anyone who has work mail come to one e-mail account and personal mail come to another—have more than one e-mail account! And yet, to check your mail on your iPhone, you need to perform a ritual dance on your iPhone. Tap into an account, tap on Inbox, check your mail, then tap the back button twice, then tap on your other account, tap on Inbox again, and check that mail. Apple’s Mac Mail app provides a unified Inbox; why not the iPhone? Thanks to Android, the Nexus One does provide such a feature. The main screen of the built-in Mail program lists all your e-mail accounts and, above it, a combined inbox (along with options to view starred mail and any drafts you might have). It’s not perfect—some indication of which mail came from which account might be a nice feature—but it’s much more convenient than doing the iPhone tap dance.